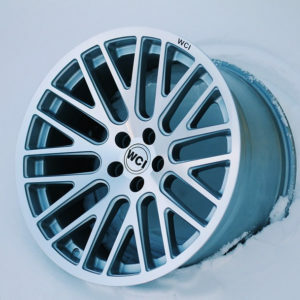 The first batch of JB1 wheels are now being made in limited quantities. We only have limited sets available to order. – Machined diamond cut face and hyper silver powdercoated windows. Finish is absolutely beautiful in person. – The JB1 is a directional wheel, which includes 2 lefts and 2 rights. Once on the car, they point the same direction! You as the customer can decide which way you would like them to point. – This wheel took us over 1 year to design and over 100 revisions. We spent a lot of time perfecting the design and hope that shows. 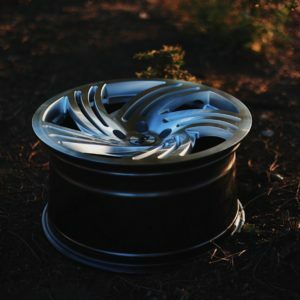 Imagine these concave spokes rolling! THE JB1 IS A DIRECTIONAL SPOKED WHEEL THAT WAS MADE TO LOOK LIKE A BEAUTIFUL OEM+ WHEEL, WHILE ROLLING. THE WHEELS ARE DIRECTIONAL AND COME WITH 2 LEFTS AND 2 RIGHTS. ONCE ON THE CAR THE WHEELS WILL FACE THE SAME DIRECTION. THIS MEANS THAT YOU CAN HAVE THE WHEELS POINT FORWARD OR BACKWARD ONCE ON THE CAR. 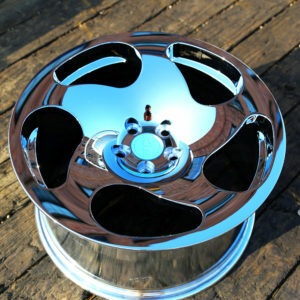 THE WHEEL FEATURES AN EXTREME CONCAVE DESIGN. THE JB1’S THAT ARE 10 WIDE ARE MORE CONCAVE THAN THE 9. OFFSET AND BOLT PATTERN DO NOT CHANGE THE CONCAVITY OF THE WHEEL, ONLY THE WIDTH. THE JB1 IS VIA AND JWL APPROVED. THE JB1 FEATURES A SLEEK MACHINED FINISH FACE WITH HYPER SILVER POWDERCOATED WINDOWS.